Retro car, originally uploaded by Roxy_l. This weekend has been amazing weather, so sunny and warm which means a happy Roxy. I embraced the sun and wore a dress on saturday, and sunday too but it was actually cold by sunday. I saw people wrapped up in coats and scarves, looking at me with crazy eyes while I pretended 'I don't need a cardi at all, really it's not cold!'. Last night I went to the cinema to see Clash of the titans, it's really good. On the way we saw this amazing car, my friend said it's called a T-bird but I think she must just be thinking of Grease. 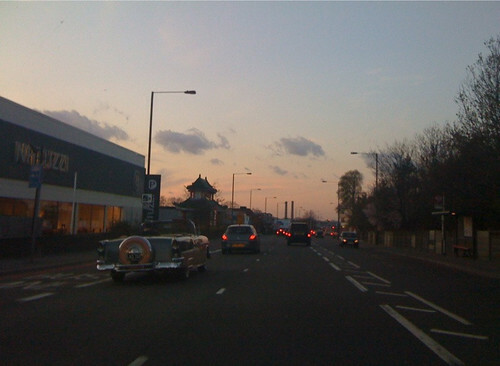 It really made my weekend, especially as it was then in front of us driving away into the sunset. 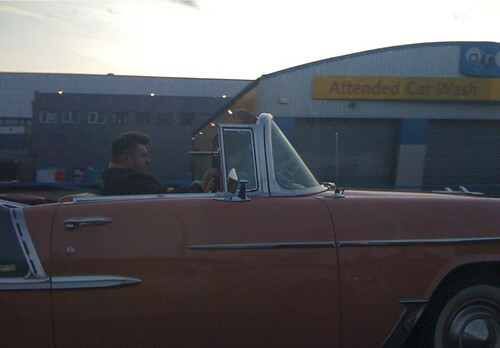 The guy driving the car has even got a 50s quiff and is wearing a leather jacket. Now that's dedication on a sunday night. I love this car and that the guy stayed in character with it, my friend did get embarrassed of me taking photos but I would have been mad at myself if I hadn't.